The Vickers Vimy was a British heavy bomber aircraft of the First World War and post-First World War era. It achieved success as both a military and civil aircraft, setting several notable records in long-distance flights in the interwar period, the most celebrated of which was the first non-stop crossing of the Atlantic Ocean by Alcock and Brown in June 1919. Reginald Kirshaw "Rex" Pierson, chief designer of Vickers Limited (Aviation Department) in Leighton Buzzard, designed a twin-engine biplane bomber, the Vickers F.B.27 to meet a requirement for a night bomber capable of attacking targets in Germany, a contract being placed for three prototypes on 14 August 1917. Design and production of the prototypes was extremely rapid, with the first flying on 30 November 1917, powered by two 200 hp (150 kW) Hispano Suiza engines. It was named after the Battle of Vimy Ridge. 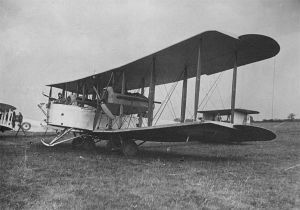 By October 1918, only three aircraft had been delivered to the Royal Air Force, one of which had been deployed to France for use by the Independent Air Force. The war ended, however, before it could be used on operations. The Vimy only reached full service status in July 1919 when it entered service with 58 Squadron in Egypt. 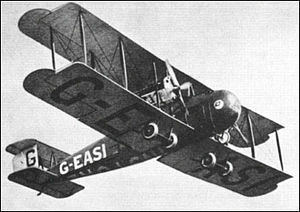 The aircraft formed the main heavy bomber force of the RAF for much of the 1920s. The Vimy served as a front line bomber in the Middle East and in the United Kingdom from 1919 until 1925, when it was replaced by the Vickers Virginia, but continued to equip a Special Reserve bomber squadron, 502 Squadron at Aldergrove in Northern Ireland until 1929. The Vimy continued in use as a training aircraft, many being re-engined with Bristol Jupiter or Armstrong Siddeley Jaguar radial engines. The final Vimys, used as Target aircraft for searchlight crews remained in use until 1938. In 1920, Lieutenant Colonel Pierre van Ryneveld and Major Quintin Brand attempted to make the first England to South Africa flight. They left Brooklands on 4 February 1920 in the Vimy G-UABA named Silver Queen. They landed safely at Heliopolis, but as they continued the flight to Wadi Halfa they were forced to land due to engine overheating with 80 mi (130 km) still to go. A second Vimy was loaned to the pair by the RAF at Heliopolis (and named Silver Queen II). This second aircraft continued to Bulawayo in Southern Rhodesia where it was badly damaged when it failed to take off. 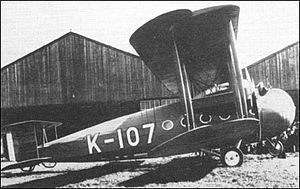 Rynevald and Brand then borrowed a Airco DH.9 to continue the journey to Cape Town. They were disqualified as winners but nevertheless the South African government awarded them �5,000 each. The Vimy Commercial was a civilian version with a larger diameter fuselage (largely of spruce plywood), which was developed at and first flew from the Joyce Green airfield in Kent on 13 April 1919. Initially, it bore the interim civil registration K-107, later being re-registered as G-EAAV. A Chinese order for 100 is particularly noteworthy, although a failure to pay interest from April 1922 probably led to the order not being completed. Forty of the 43 built were delivered to China but most remained in their crates unused, with only seven of these being put into civilian use. During the Second Zhili-Fengtian War, these bomber versions of the Vimy Commercial initially were highly successful due to the low level bombing tactics used, with the air force chief-of-staff of the Zhili clique, General Zhao Buli (趙步壢) personally flying many of the missions. However, on 17 September, returning from a successful bombing mission outside Shanhai Pass, General Zhao's converted Vickers Vimy bomber was hit by the ground fire of the Fengtian clique in the region of Nine Gates (Jiumenkou, 九門口) and had to make a forced landing. Although General Zhao was able to make a successful escape back to his base, the bombers subsequently flew at much higher altitude to avoid ground fire, which greatly reduced their bombing accuracy and effectiveness. After numerous battles between Chinese warlords, all of the aircraft fell into the hands of the Fengtian clique, forming its First Heavy Bomber Group. These bombers were in the process of being phased out at the time of the Mukden Incident and therefore were subsequently captured by the Japanese, who soon disposed of them. Apart from a replica transatlantic Vimy cockpit section built by Vickers for the London Science Museum in the early 1920s, three full-size replicas have also been built. The first was a taxiable replica commissioned by British Lion Films from Shawcroft Models Ltd of Iver Heath, Bucks; unfortunately the planned film about Alcock & Brown's transatlantic flight was never made but the model was completed and paid for. Its fate remains a mystery (see 'Aeroplane' magazine, May 2010) although it appeared on static display at the Battle of Britain air display at RAF Biggin Hill in 1955 and may have been subsequently stored dismantled in East London until at least the late 1980s. 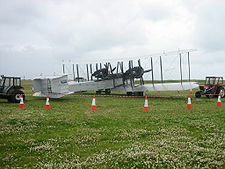 In 1969, an airworthy Vimy replica (registered G-AWAU) was built by the Vintage Aircraft Flying Association at Brooklands (this aircraft was first flown by D G 'Dizzy' Addicott and Peter Hoare but was badly damaged by fire that Summer and is now displayed at the RAF Museum, Hendon, London). A second flyable Vimy replica, NX71MY, was built in 1994 by an Australian/American team led by Lang Kidby and Peter McMillan and this aircraft successfully recreated the three great pioneering Vimy flights: England to Australia flown by Lang Kidby and Peter McMillan (in 1994), England to South Africa flown by Mark Rebholz and John LaNoue (1999) and in 2005, Alcock and Brown's 1919 Atlantic crossing was recreated, flown by Steve Fossett and Mark Rebholz. The aircraft was donated to Brooklands Museum in 2006 and was kept airworthy in order to commemorate the 90th anniversaries of the Transatlantic and Australian flights until retired in late 2009. Its final flight was made by John Dodd, Clive Edwards and Peter McMillan from Dunsfold to Brooklands on 15 November 2009 and four days later, in just 18 hours, the aircraft was dismantled, transported the short distance to the Museum and reassembled inside the main hangar by a dedicated volunteer team. Two days later a special Brooklands Vimy Exhibition was officially opened by Peter McMillan and this unique aircraft is now on public display there. F.B.27 Vimy: Prototypes; four built. F.B.27A Vimy II: Twin-engine heavy bomber aircraft for the RAF. Vimy Ambulance: Air ambulance version for the RAF. Vimy Commercial: Civilian transport version. Powered by two Rolls-Royce Eagle VIII piston engines. Grands Express A�riens (Vimy Commercial).